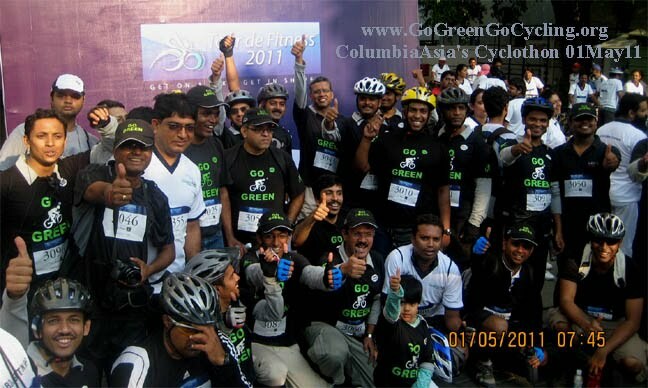 GoGreen supporting ColumbiaAsia's Cyclothon 01May11 - GGI-Group size: 4000+ Professionals, Increasing on day to day basis, Come & join us 2 serve Mother Nature. 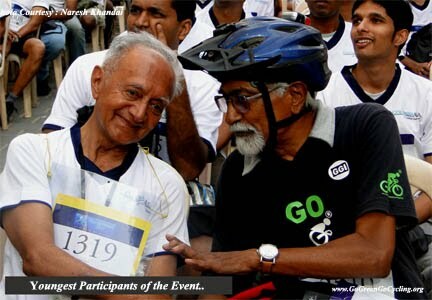 137 GGI's Registered for the CloumbiaAsia Cyclothon out of which 83 Participated. Most of them missed to pick the BIB-No on Saturday as their was heavy rain and also Brevertes Medal distribution was also at the same timigs..
On 1st May, Sunday early morning, GGI-South headed by Thimmana Bhat, Rajaram & Mukand, started by 6:00am & reached Kanteerva Stadium gate No: 3 by 6:30am where other GGI's from other parts were already present. We had a seprate counter for BIB collection and we also requested onspot registration for people who had missed registering, good to see quite few people utalized this option . 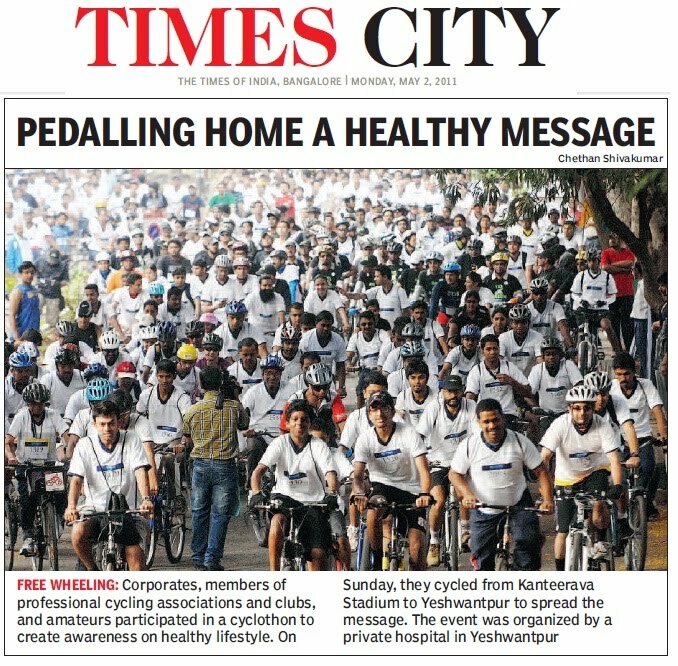 By 7:00am around 1000 people ranging from 5 to 84 gathered at the Kanteerva Stadium for the cyclothon organised by Columbia-Asia Hospital. Excitement was clearly visible on every one’s face. People with their own cycles were waiting for the flag off to start. 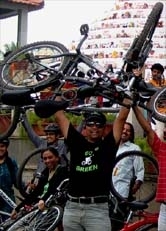 Those who opted for cycles were busy collecting the cycles from the organisers. 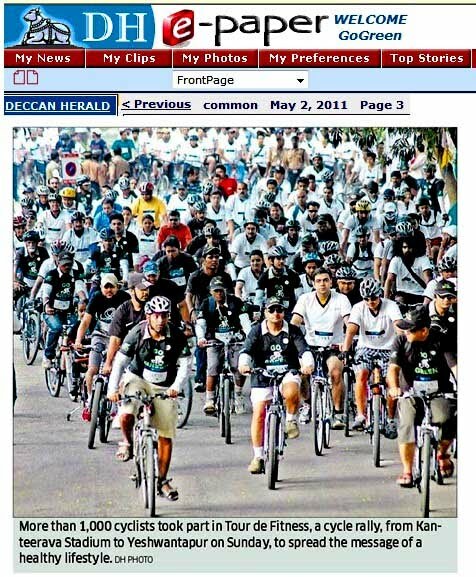 By 7.00 the chief guest, Mr Bhaskar Rao, the Transport Commissioner flagged off the cyclothon event which was named "Tour De Fitness 2011". 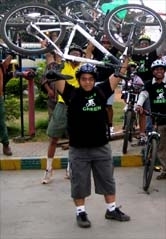 Along with GoGreen or GGI or GGGC Group their wer other groups, corprates and individuals took part in the event. As usual GoGreen's group was outperforming interns of Group participation. The weather was quite supportive for the participants. The complete route was of 10kms starting from the Kanteerava Stadium up to the Columbia-Asia Hospital at Yeshwanthpur. It was a hassle free ride as first of all it was a Sunday morning and the traffic controller was aware of the event hence there was full support from them. It took hardly 30 minutes for all the participants to reach the destination. All enjoyed spreading the dream of greenness and healthy life across the way. Volunteers were there throughout the rout to assist the participants. Refreshment was arranged by the organisers at the destination. Mr Tufan Ghosh, CEO, Columbia Asia Hospital addressed the crowd. He said "We at Columbia Asia are committed towards building a healthy society and this is a small effort in the direction. We are pleased that Bangaloreans participated in large numbers and took a pledge to lead a healthy lifestyle." "The rigours of a fast-paced lifestyle manifest itself into a number of lifestyle diseases. Fitness has taken a backseat triggering multiple health issues" said Mr Jairam, group Medical Director and Chairman of Columbia Asia Hospitals. 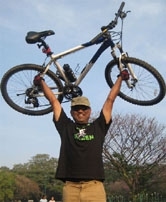 Mr Prabhakar Rao, Founder, Go Green Go Cycling said "Apart from saving money, natural resources and saving Mother Nature, being fit and healthy is one of the key benefits one can achieve by cycling." The best part of the event was the appreciation for the youngest participant of the event who was a girl of 5 years old and the oldest participant was Mr. B.R Janardhan(75), who shared his experience saying " I started cycling at the age of 62 and now I am 75. I have made several trips to the Himalayas............................"
Adding fun to the event, special prizes were distributed among participants. It was lucky Sunday morning for more than 20 participants who got Rs.2000 gift coupons because of their special BIB numbers. The event was co-sponsored by Wrangler and Value Design Build (VDB) and was supported by Go Green Go Cycling Association.